Not all that long ago in a galaxy not all that far away…A band the likes of which the universe had never seen was formed for one purpose — to create an unstoppable musical “force” known as Galactic Empire. 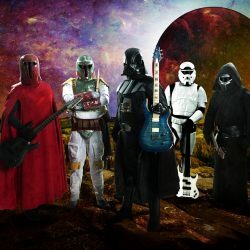 By reinterpreting classic selections from legendary composer John Williams’ iconic scores from the Star Wars saga into guitar-driven heavy metal, Galactic Empire has created a musical juggernaut feared in many systems. Comprised of some of the most infamous villains in the galaxy – lead guitarist Dark Vader, drummer Boba Sett, guitarists Red Guard and Kyle Ren, and bassist Bass Commander – Galactic Empire’s commitment to their mission is unparalleled. From a foreboding rendition of “The Imperial March” to the sweeping guitars of “Duel of the Fates”, the band’s faithful translations of Williams’ classic scores has created a new dynamic where fandom and music overlap. Joining Galactic Empire will be DJ Q-Ball from Bloodhound Gang and local band The Horrornauts. The Downtown Alive concert series is presented by the Reading Downtown Improvement District in partnership with Illusion Sound & Lighting, which is booking the acts, and Greater Reading Chamber Alliance (GRCA). Major funding for the concert series is provided by Berks County Community Foundation through its Hawley and Myrtle Quier Fund, and Berks County Convention Center Authority. Weidenhammer is the Platinum Sponsor. Go to www.downtownalivereading.com for additional information.